The Season XVI WPT Tournament of Champions is around the corner. On Thursday, May 24, 2018, World Poker Tour title holders will embark on fabulous Las Vegas to compete in the prestigious event at ARIA Resort & Casino. The final table will play out at Esports Arena Las Vegas at Luxor Hotel & Casino on Saturday, May 26. In lead up to the event, WPT.com is featuring all of the winners from Season XVI, who, along with the hefty first-place prize, earned a $15,000 seat into the season-ending WPT Tournament of Champions. Next up is Guo Liang Chen, who topped a huge field of 1,132 entries in the WPT Borgata Poker Open Championship to win $789,058. The largest prize awarded for a $3,500 buy-in WPT Main Tour event in Season XVI went to Guo Liang Chen at the Borgata Poker Open. Chen rose from a final table of local pros and former WSOP Main Event final tablist Cliff Josephy to win $789,058. The win continued the trend to start Season XVI of unknown players emerging from well-armed fields. Chen joins all Season XVI champions next week for the WPT Tournament of Champions at ARIA Resort & Casino. To many, Chen’s win came as a surprise. For Chen, he expected to do well at a casino he is well familiar with. Seven months later, Chen has made it all the way to Las Vegas for the prestigious WPT Tournament of Champions. Chen’s journey there started before he lifted the WPT Champions Cup. Up until his WPT triumph, all of Chen’s career tournament results were either at the Borgata or former WPT Main Tour location Parx Casino in suburban Philadelphia. The tournaments at both locations forged experience within Chen that allowed him to fight through five days of poker. To finally break through an win a live tournament carries a special place in the heart of Chen. Of Chen’s 20 career live cashes, 12 of them have come at Borgata. The largest buy-in outside of the $3,500 buy-in WPT Borgata Poker Open Championship on Chen’s list is $560. 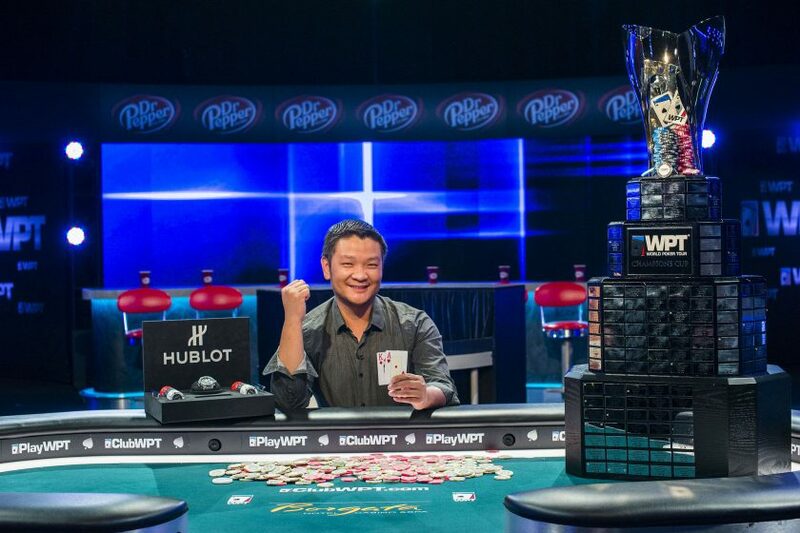 The volume Chen spent to prepare his game for a WPT tournament paid off in the perfect spot. The $300 and $500 tournaments at Parx provided a similar format to the WPT at Borgata. In August 2016, Chen finished 14th in the Parx 300 in a field of 2,557. A week later, Chen topped the result with a seventh-place run versus 1,193 entries. The 90-minute levels deep in the event were familiar to Chen as he started to emerge within the end game of the WPT Borgata Poker Open. Chen started Day 4 18th out of 24 players, but healthy with 41 big blinds. The last level before the Day 3 bags came out and Chen was down to 23 bigs. The situation became direr for Chen with 15 players remaining. He was down to only 11 big blinds but picked up the pace to move back into contention. Chen’s tournament life was on the line versus Thomas Paul and called correctly with just a single pair to boost his title hopes. As exampled in the Paul hand, Chen did not shy away from taking risks when he thought he had the best hand. That style carried over to the final table. The eight-hour final table, which will soon be available to watch on FOX Sports Regional Networks, featured a mountain of memorable hands from Chen. Chen showed a king-high bluff to Paul, and followed the feat up with a double up with pocket kings less than an orbit later. The aggressive style allowed Chen to be paid off when the chips were at a peak value. During three-handed play, Chen showed a potential bluff to eventual heads-up opponent Greg Weber. A little bit of luck never hurts in a tournament and Chen says he received his fair share. Chen is a fan of pocket eights and used them to double up against Jia Liu. Chen is playing for a title defense of sorts at the WPT Tournament of Champions. Season XV WPT Winter Poker Open champion Daniel Weinman built on his Borgata WPT win from January and won another prestigious event three months later. Defending WPT Borgata Poker Open winner Jesse Sylvia also made the money, taking eighth. Chen is likely to be an unknown to all of his competitors. His quiet personality does not draw any attention to him at the table. If he takes a few hands off, it’s possible to forget Chen is even there. The Virginian claimed confidence in his ability to win at Borgata. Those same tools are needed to have a chance in the loaded WPT Tournament of Champions field. The victory allowed Chen to alter his career path and join a new field full-time with which he has already enjoyed success in. Chen played in additional Season XVI events but failed to get on the board for a second time. The WPT Tournament of Champions is a great time to reverse that downswing. Wherever Chen finishes, expect to see a fun show put on display in Las Vegas starting on May 24.